Attention!! All CA Intermediate / IPCC students here is news for you. ICAI has declared the new CA IPCC date sheet/timetable for May 2019 attempt. In the last announcement By ICAI on 14th February 2019, it announced the timetable in respect of May 2019 for IPC / CA Intermediate along with that of CA Foundation and CA Final for both old and new scheme. Due to Legislative Elections, IPCC and CA Intermediate May 2019 exams are postponed 3 weeks from the last release dates, The exams will be starting from the last week of May for Both courses. Check below ICAI latest released notification about the exam dates. 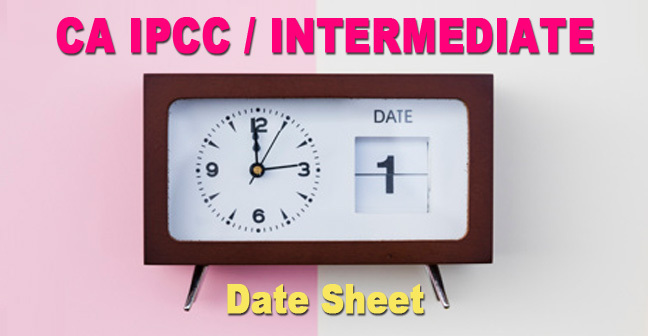 And the complete list of dates of CA IPC and Intermediate exam for May 2019. CA Intermediate Group 2 Papers Study Plan. The timings for CA Inter May 2019 Examinations has been set in the afternoon session i.e. 2:00 PM to 5:00 PM. ICAI issues CA IPCC Admit Card generally 21 days before the exam. It is needed you to appear in the examination hall. ICAI has also informed its students that no physical admit cards will be sent. They can only download it from the ICAI Portal. Download CA IPCC May 2019 Admit card. In order to appear in the CA IPCC May 2019 Examination, one must submit the application form available on the ICAI website. Students can fill the form group wise depending on their preparation. Know the procedure to fill the CA IPCC May 2019 Application form. The last date for submission of application forms is 23rd March 2019 with late fees. ICAI has clearly instructed to fill the forms carefully reading the completed guidelines issued by the ICAI in respect of Application Forms. However, still, there are few students who committed some mistakes while filling their forms. For such students, ICAI has facilitated correction window in which students can correct any error done in respect to Medium and Center. Yes, the correction window facilitates you to do the correction in respect of the only center and medium. Conclusion - In this article, we have shared with you the date sheet issued by the ICAI for CA Intermediate / IPCC May 2019 Examination. Further, we have also discussed the timings for the CA Inter exam. Stay in tune for our next article CA Intermediate Application Form May 2019.